We all remember the fun of biting off the ears of a chocolate bunny. Bring that same experience to your kids by putting one in each of their Easter baskets. Hollow milk chocolate is the typical selection, but you could always change things up based on your child's preference. You could opt for solid white chocolate or maybe go for a rabbit filled with marshmallow or caramel. Just be sure you include some type of chocolate bunny in your little one's basket. Everyone loves this childhood classic. Whether you prefer chicks or bunnies, it's just not Easter without Peeps. These sugar-coated marshmallows come in a variety of shapes, sizes and colors. Some like them fresh while others like to let them get a little stale before diving into a package. They're almost too cute to eat, but chances are that won't stop any kid from gobbling them up. Peeps make the perfect addition to any Easter basket. Reese's peanut butter eggs are another treat that no basket should be without. There's just something about those little ovals of goodness. Some say it's the ratio of peanut butter to chocolate that makes them even better than the original. However, you may not know that these eggs contain slightly more sugar than their cup cousins. Since there's no fluted paper underneath, the extra bit of sweetness prevents sticking on the conveyor belt and also tickles your taste buds. Reese's peanut butter eggs are a perennial favorite for kids and adults alike. Jelly beans are the quintessential springtime treat. They really aren't optional when it comes to crafting an Easter basket. However, you do have a choice when it comes to the flavor. From spiced and speckled to tropical and sour, the store shelves are filled with dozens of varieties to choose from. Pick up a bag that you think your child will enjoy. While you're at it, make sure you like whatever kind you choose. That way you can eat the leftovers! There's no better way to cap off an Easter basket than a good, old-fashioned Cadbury crème egg. The milky chocolate filled with vanilla fondant is the ultimate combination. Watch as your little one bites into the gooey treat and let the fun begin! Sure, some sticky fingers and chocolaty cheeks are likely to result, but that's just part of being a kid. Grab a couple from the bins in the Easter section and give your child a sweet surprise on Easter morning! All kids love waking up to discover what the Easter Bunny left in their baskets. Help out that famous rabbit by picking up the tasty treats on this list. Your child will squeal with delight when he or she eyes all of these timeless candies. A holiday is a great opportunity to put the dietary rulebook aside for a moment and just let your kids be kids. 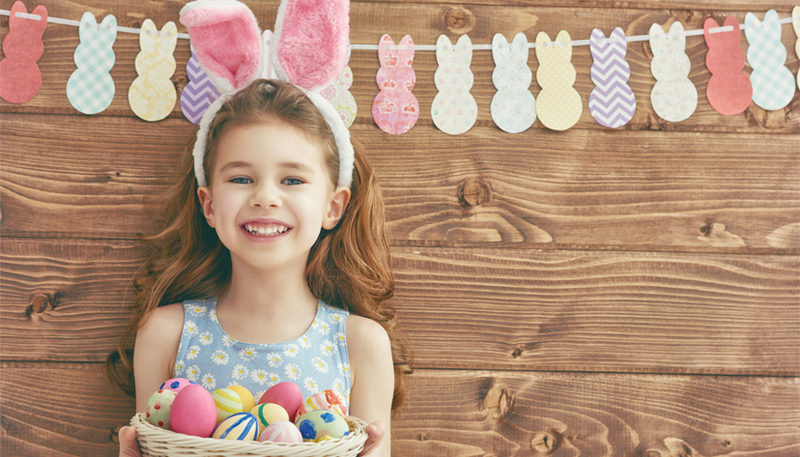 Build the perfect basket with some sweets for your little sweetie this Easter!